One of the most evident of Advent customs, familiar to most, is of course the Advent wreath, which is a beautiful way of marking the progression of the Advent season and for preparing for the great feast of the Nativity of Our Lord. 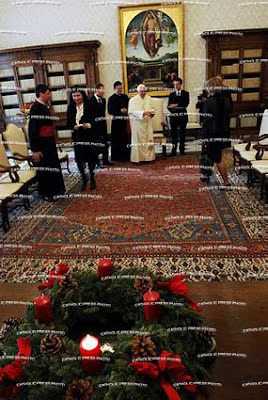 The Advent wreath originated a few hundred years ago among the Lutherans of eastern Germany. It probably was suggested by one of the many light symbols which were used in folklore at the end of November and beginning of December... The Christians in medieval times kept many of these lights and fire symbols alive as popular traditions and ancient folklore. In the sixteenth century the custom started of using such lights as a religious symbol of Advent in the houses of the faithful. This practice quickly spread among the Protestants of eastern Germany and was soon accepted by Protestants and Catholics in other parts of the country. Recently it has not only found its way to America, but has been spreading so rapidly that it is already a cherished custom in many homes. The Advent wreath is exactly what the word implies, a wreath of evergreens (yew or fir or laurel), made in various sizes. It is either suspended from the ceiling or placed on a table, usually in front of the family shrine. Fastened to the wreath are four candles standing upright, at equal distances. 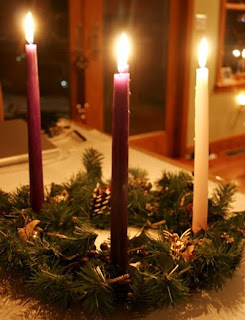 These candles represent the four weeks of Advent. Daily at a certain time (usually in the evening), the family gathers for a short religious exercise. Every Sunday of Advent one more candle is lit, until all four candles shed their cheerful light to announce the approaching birthday of the Lord. All other lights are extinguished in the room, and only the gentle glow of the live candles illuminates the darkness. After some prayers, which are recited for the grace of a good and holy preparation for Christmas, the family sings one of the traditional Advent hymns or a song in honor of Mary. 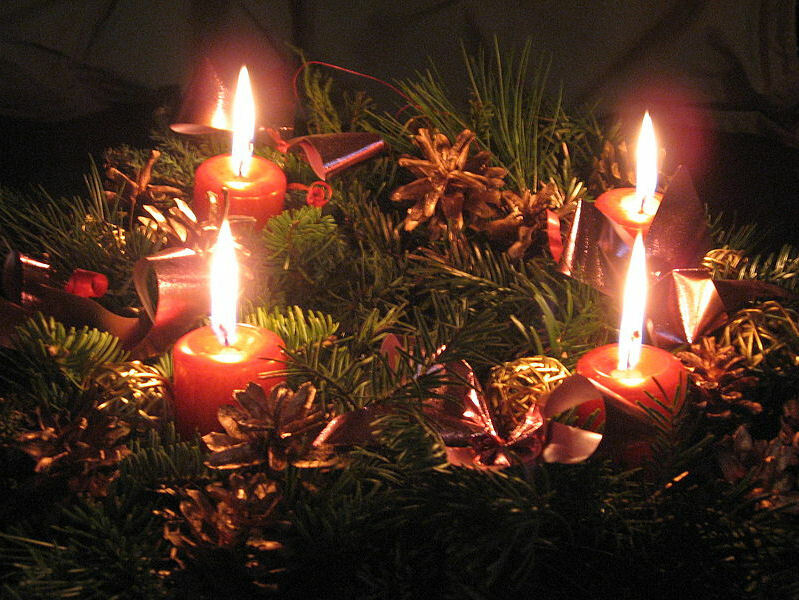 The traditional symbolism of the Advent wreath reminds the faithful of the Old Testament, when humanity was "sitting in the darkness and in the shadow of death" (Luke 2:79); when the prophets, illumined by God, announced the Redeemer; and when the hearts of men glowed with the desire for the Messiah. The wreath -- an ancient symbol of victory and glory -- symbolizes the "fulfillment of time" in the coming of Christ and the glory of His birth. In some sections of Europe it is customary for persons with the name of John or Joan to have the first right to light the candles on the Advent wreath and Christmas tree, because John the Evangelist starts his Gospel by calling Christ the "Light of the World" and John the Baptist was the first one to see the light of divinity shining about the Lord at His baptism in the Jordan. So common is it in fact, many may be surprised to learn that this is by no means universal, nor even the original custom. Within Germany itself, the traditional custom has been (and still is), not for violet and rose candles to be used, but instead, red. 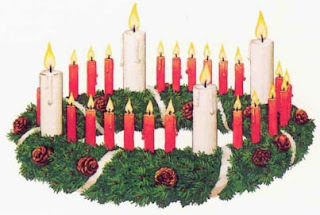 Finally, on a historical note, some may also be interested to see this early German form of the Advent wreath, created by Johann Hinrich Wichern in 1839, which had 23 candles; 19 red candles (to be lit on the weekdays of Advent) and 4 white (to be lit on the Sundays of Advent).